Happy Feast Day of the Baptism of Our Lord! Since we will be at the actual site of Jesus’ baptism in two weeks with a bus full of pilgrims, I thought I would share this post again. 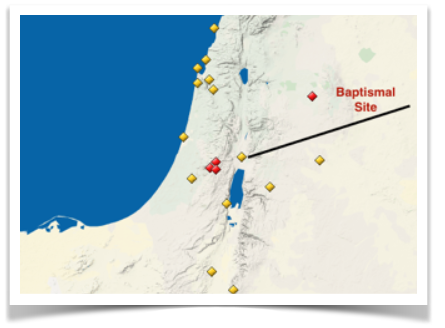 This is an exciting development which helps establish the authentic baptismal site of Jesus. With the involvement of UNESCO the site will receive protection, funding and recognition. This is the place where the last three popes commemorated the Baptism of Our Lord. 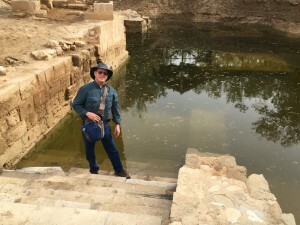 The Bible says in John 1:28, “This took place in Bethany beyond the Jordan, where John was baptizing.” The authentic site is just above the northern tip of the Dead Sea, east of Jericho. The actual site is not on the Israel side of the Jordan, but on the Jordan side of the river. Here is a picture of me standing in the exact spot that archaeology, the Bible and early Christians and pilgrims located the spot. The early Christians knew and built churches there to commemorate the site. If you would like to join us in Jordan, contact Elizabeth at 800-727-1999, 150. We will be visiting Jordan once every year on one of our trips to Israel. Register for these small groups or get your name on the list now since all of our trips have been selling out. This 2-minute video link below takes a few seconds to load, but wait… it is nice and you will see where we are today. With Elijah and Jesus on the banks of the Jordan River in Jordan. Produced by the Jordanian Tourist Bureau.